BAY CITY, MI — The State Theatre was awarded the Historical Society of Michigan’s 2006 State History Award for Preservation at the 132nd State History Conference in Bay City. Built in 1908 during the booming lumbering era in Michigan, the State Theatre was known as the Bijou and was one of many vaudeville and burlesque houses in downtown Bay City. 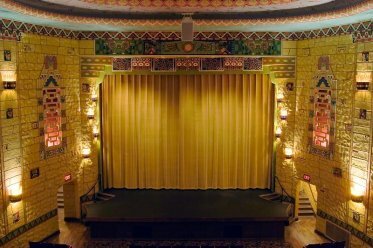 The Bijou was renovated in 1930 by renowned architect C. Howard Crane whose impressive body of work includes the twin Fox Theatres in Detroit and St. Louis, Missouri. Mr. Crane designed the Bay City State Theatre to resemble a Mayan Temple and the theater remains a magnificent example of art deco architecture which exudes a warm and intimate character with seating on the main floor as well as a second floor balcony. To read more, visit My Bay City. This is truly a beautiful theatre that has been restored by caring and dedicated residents of Bay City. Can anyone tell me if there is a theatre in Houghton MI? While viewing the Weather Channel they reported from this UP of MI community and I thought I saw a cinema marquee in the background.